From my notes I present a digested lesson from our Bible Study on Sunday Morning. God is a covenant maker and Jeremiah prophesied: Jeremiah 31:33 "But this is the covenant which I will make with the house of Israel after those days," declares the LORD, "I will put My law within them and on their heart I will write it; and I will be their God, and they shall be My people. God’s laws are perfect: Psalms 19:7 The law of the LORD is perfect, refreshing the soul. The statutes of the LORD are trustworthy, making wise the simple. John 8:12 Then Jesus spoke to them again: "I AM the light of the world. Anyone who follows Me will never walk in the darkness but will have the light of life." John preached that Jesus is the true light of the world. John 1:9 That was the true Light, which lights every man that cometh into the world. He was in the world, and the world was made by him, and the world knew him not. In him was life; and the life was the light of men. And the light shines in darkness; and the darkness could not put it out. We considered the story in John 9: 1-18 of the man who was blind and Jesus healed him bringing LIGHT into his once darkened world. The culture of that day was to curse those who were blind. Name calling was common and spitting on the blind person was also a method to curse them. Jesus used the method of the spit curse, to spit on clay and rub it in the man’s sightless eyes. “Go and wash in the pool of Siloam” Jesus told the man. The man obeyed and came away seeing. Many were witnessed that this blind man could now see. In the mouth of two or three witnesses a fact would be considered true. 2 Corinthians 13:1 This third time I am coming unto you. In the mouth of two or three witnesses shall every word be established. The Jewish leaders asked the man’s parents; “Is this your son and was he born blind? How did this happen.” The man’s parents said, “Yes, this is our son, but how he is now seeing we do not know.” They were afraid if they said more they would be put out of the synagogue. The culture then and still is in some lands; the “mind set” that a male child is most important. There is usually a very close 'Father – Son' relationship. Jesus came to reveal the Father, and openly said, He could do nothing of himself, but only did as the Father told him to do. He only spoke from the Father’s heart the words from heaven. 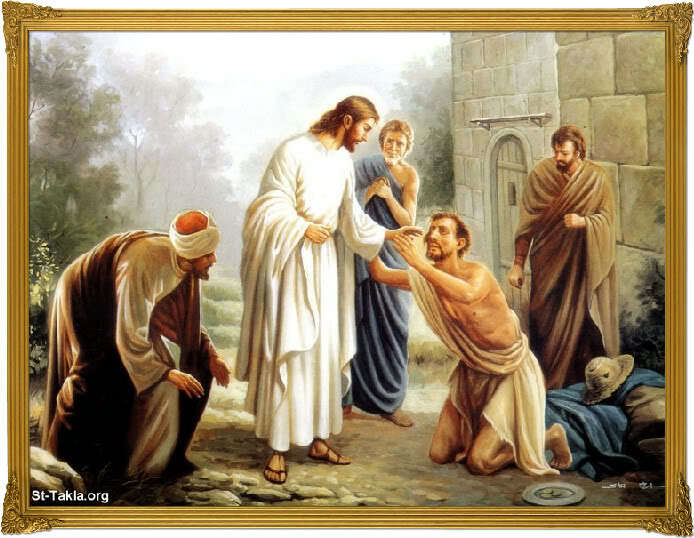 Jesus being the Light of the world, brought light into this blind man’s dark existence. Jesus brings Light into our sinful darkness and changes us into his light. We were blind, but now I see. 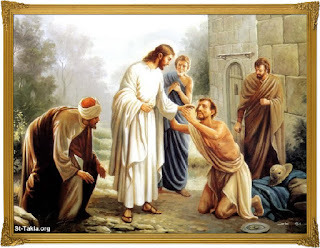 The man did not ask to be healed. How did Jesus do this? Did He form new eyes from the mud? Did the scales come off when the man washed? We do not really know, but the man gave Jesus credit for being a prophet. Allow the Holy Spirit to minister to you and show you things that need to be washed and removed. Let the Holy Spirit to speak to you and shed light on certain subjects you have been questioning. The Holy Spirit will use a willing vessel and comfort others through your obedience. Share with others maybe a scripture of just a few words from the inner spirit to comfort your friends or family. Many believed on Him, yet others questioned: “Who are you? Where is your father?” Even when Jesus told them plainly, I AM the way, I AM the Bread, I AM the LIGHT, they refused to understand.